The best way to celebrate Star Wars Day is to learn something new about a galaxy far, far away. So here are 50 fascinating facts about Hollywood's most iconic space epic. 1. LUKE SKYWALKER IS THE HERO WITH A THOUSAND FACES. Though equally inspired by fairy tales, westerns, and 1930s sci-fi serials, George Lucas based the framework of the story for the original Star Wars (1977) around the theories of Joseph Campbell’s book, The Hero with a Thousand Faces. The book tracked common mythological motifs and argued that myths from around the world that have been passed down through generations—like Beowulf or King Arthur—share a basic structure. According to Campbell, “A hero ventures forth from the world of common day into a region of supernatural wonder: fabulous forces are there encountered and a decisive victory is won; the hero comes back from this mysterious adventure with the power to bestow boons on his fellow man.” Lucas simply grafted these ideas onto his story, with Luke as the main hero. 2. LUCAS ALSO RELIED ON AKIRA KUROSAWA FOR THE STORY’S P.O.V. Lucas struggled with just how to tell this massive sci-fi space opera on a personal and relatable scale, and he found the answer in director Akira Kurosawa’s 1958 film The Hidden Fortress. Telling the story of a roguish general protecting a beautiful princess from an evil clan behind enemy lines, “the one thing I was really intrigued by was the fact that the story was told from the two lowest characters,” Lucas explained in an interview for The Criterion Collection’s release of the Kurosawa classic. “I decided that would be a nice way to tell the Star Wars story. Take the two lowliest characters, as Kurosawa did, and tell the story from their point of view. Which, in the Star Wars case is the two droids, and that was the strongest influence. The fact that there was a princess trying to get through enemy lines was more of a coincidence than anything else." Perhaps not coincidentally, the word “Jedi” is allegedly derived from the Japanese word Jidaigeki meaning “period dramas,” or the types of films Japanese directors like Kurosawa would typically make (the kind of movies that clearly influenced Lucas). 3. LUCAS’S INITIAL DRAFT OF THE SCRIPT WAS TOO LONG. In 1973, Lucas submitted a 13-page treatment of his story, originally titled “The Star Wars,” to Universal Studios and United Artists following the success of his movie American Graffiti (which was nominated for five Oscars, including Best Picture and a Best Director nod for Lucas) the same year. Both studios passed, saying the far-flung sci-fi extravaganza was too confusing. The treatment was eventually picked up by 20th Century Fox head Alan Ladd Jr., who gave Lucas a preliminary deal in 1974 to eventually make the movie. But the “final” screenplay Lucas turned in was more than 200 pages long (the average length of a screenplay is between 95 and 125 pages), so Lucas excised the final two acts and presented the first act of the screenplay as the finished story. The script was made into Star Wars, and the final two acts of the initial giant screenplay were eventually expanded and fleshed out into what would become The Empire Strikes Back and Return of the Jedi. 4. LUCAS USED VISUAL AIDS TO SELL THE MOVIE. 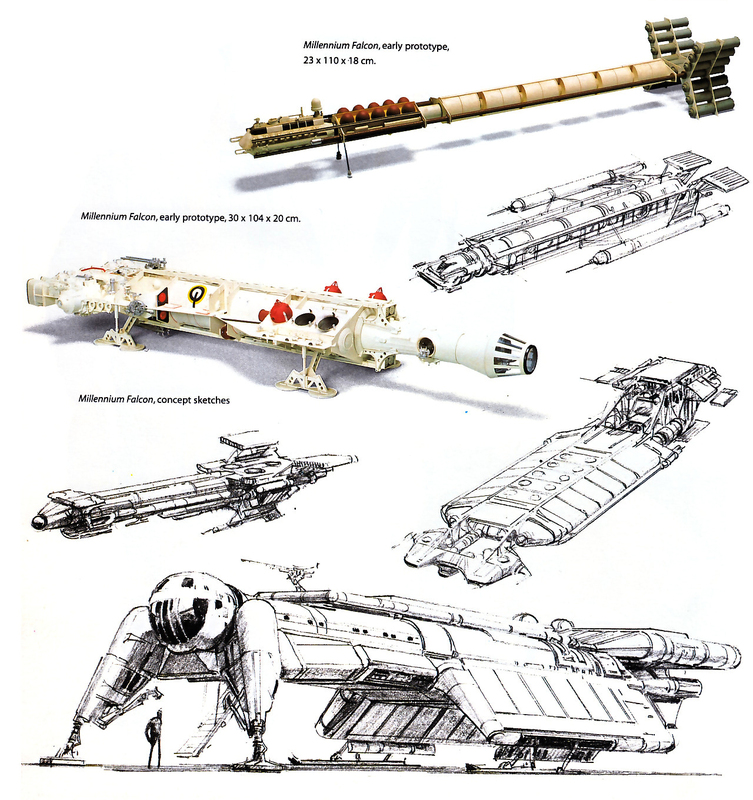 To get 20th Century Fox to approve the then-massive budget of almost $10 million (though the final budget eventually came in at around $11 million), Lucas pitched Star Wars with a series of 21 drawings he commissioned from illustrator Ralph McQuarrie. These included scenes of C-3PO and R2-D2 crash-landing on Tatooine, Vader confronting Luke (then with the surname of “Starkiller”) with his lightsaber, the Mos Eisley cantina, the Millennium Falcon in Docking Bay 94, the attack on the Death Star trench, and a view of a floating city that would eventually become Bespin in The Empire Strikes Back. 5. LUCAS INITIALLY PLANNED ON MAKING EXTREME CASTING CHOICES. 6. HARRISON FORD WAS CAST AS HAN SOLO BY ACCIDENT. Lucas shared the seven-month-long casting sessions for Star Wars with his friend and fellow director Brian De Palma, who was casting for Carrie at the same time. Lucas was looking for unknown faces that he had never worked with before, and initially brought in Harrison Ford—who had appeared as the antagonist street racer Bob Falfa in Lucas’s American Graffiti—to feed lines to the auditioning actors. Lucas saw dozens of actors—including a young Kurt Russell—for the part of Han, but liked Ford’s delivery feeding lines to the other actors so much that he caved and cast him in the part. 7. SOUND DESIGNER BEN BURTT CREATED A WHOLE NEW WORLD OF SOUNDS. Now-legendary sound designer Ben Burtt got his start on Star Wars fresh out of USC film school. He was tasked with coming up with a completely new and organic soundscape for the movie, which was at odds with the trend of creating intentionally electronic and “futuristic” sounds for sci-fi movies at the time. The first sound effect he created was Chewbacca’s voice, which is a blend of bear, lion, walrus, and badger vocalizations. R2-D2’s “voice” was made using loops on a synthesizer matched with beeps and boops modeled after baby coos performed by Burtt himself. Darth Vader’s infamous breathing was recorded by putting a microphone inside a regulator on a scuba tank. The Tusken Raider yowl is a mixture of mule sounds and people imitating mule sounds. The lightsaber whoosh was made by blending the hum of an idle 35mm film projector and passing a slightly broken microphone cable by the tubes of an old television set. 8. THE NAME “DARTH VADER” WASN’T ANYTHING SPECIAL TO LUCAS. 9. ORSON WELLES WAS ALMOST DARTH VADER. George Lucas originally wanted Orson Welles as the voice of Darth Vader, but dropped the idea when he thought Welles’s famous baritone would be too recognizable. 10. JAMES EARL JONES PUT IN LESS THAN A DAY’S WORK. 11. THE MOVIE’S ICONIC OPENING CRAWL WAS CREATED WITH PRACTICAL EFFECTS. The opening crawl for the original movie (which was cribbed from the Flash Gordon serials that also inspired the film) was done practically, by carefully placing 2-foot-wide die cut yellow letters over a 6-foot-long black paper background with a camera making a slow pass over them to mimic the crawl. In total, it took three hours to shoot. 12. LUKE AND LEIA’S SWING ACROSS THE DEATH STAR CHASM WAS FOR REAL … KIND OF. The relatively small production of Star Wars at England’s Elstree Studios meant that corners had to be cut wherever possible, even for the main actors. When it came time for Luke and Leia to perform the iconic swing over the Death Star chasm, Mark Hamill and Carrie Fisher had to do it themselves because the production couldn’t afford stunt doubles. The actors, who were secured with safety harnesses, swung across the platform 30 feet above the studio floor in one take, which is what you see in the final movie (though the drop was lengthened to seem bottomless in post-production using a matte painting). 13. THE ORIGINAL MILLENNIUM FALCON LOOKED COMPLETELY DIFFERENT. The original concept model of the Millennium Falcon was long and cylindrical—very unlike the flat design we know now. The model makers complained the design was too similar to the spacecraft from the 1970s British TV series Space: 1999, so Lucas told them to create something completely different that looked like a flying hamburger and sailed like a sunfish. A variation of the Falcon prototype did, however, end up in the movie. It’s the Rebel Blockade Runner seen fleeing the Imperial Star Destroyer in the opening scene. 14. LUCAS USED REAL-LIFE WAR FOOTAGE FOR THE SPACE BATTLES. Industrial Light and Magic is now one of the preeminent special effects companies in the world, but back in the late 1970s it was just a group of artists in an empty warehouse in Van Nuys, California. The company, which invented technology like special computer-controlled camera rigs in order to create the special effects for Star Wars, was tasked with completing a year’s worth of work in just six months. To give them ideas for the type of high-intensity and cutting-edge sequences he wanted, Lucas used old newsreels to cut together footage of World War II dogfights. ILM eventually matched many of the sequences frame by frame—including the space battle in the Millennium Falcon between Han, Luke, and the TIE fighters—directly to the footage Lucas provided. 15. THEATERS DIDN’T WANT TO SHOW THE MOVIE. Less than 40 theaters agreed to book showings of Star Wars after its release date was moved up to before Memorial Day (the studio thought it would bomb in a crowded summer movie slate). Around the same time, 20th Century Fox was going to release an eagerly anticipated adaptation of a bestselling book called The Other Side of Midnight, which theaters were eager to show. Fox then stipulated that any theater showing The Other Side of Midnight must also show Star Wars, which inflated the number of screens for the movie. Needless to say, Star Wars eventually became the highest-grossing movie ever made up to that time, while The Other Side of Midnight didn’t even break the $25 million mark. And as requiring movie theaters to show one movie in exchange for another movie was actually illegal, 20th Century Fox ended up being fined $25,000—for forcing theaters to show The Other Side of Midnight. 16. LUCAS INITIALLY FUNDED THE EMPIRE STRIKES BACK HIMSELF. Due to the overwhelming success of Star Wars, and the studio trying to undermine him at nearly every turn, Lucas decided to put up the money to make The Empire Strikes Back out of his own pocket, which was unheard of in blockbuster filmmaking. The unprecedented move would give Lucas complete creative control, while still having a major movie studio distribute the movie for its theatrical release. This maneuver wasn’t without its drawbacks, however. When the budget for The Empire Strikes Back ballooned to $10 million over their original estimate, the entertainment branch of Bank of America that put up a loan to help Lucas cover the movie’s costs pulled out, despite the fact that this was the (relatively) financially secure sequel to the then-highest-grossing movie ever made. Lucas then had to approach 20th Century Fox to help, which forced him to give up certain rights on the movie. Lucas was so unhappy with Fox’s approach to the new deal that he brought a new project he was working on to rival movie studio Paramount. That new project was Raiders of the Lost Ark. 17. LUCAS RETURNED TO KUROSAWA FOR SOME INSPIRATION FOR HIS NEWEST CHARACTER. 18. A NEW DIRECTOR WAS BROUGHT ON FOR THE SEQUEL. Though Lucas decided to back out of directing The Empire Strikes Back, he remained a very hands-on producer, guiding the movie throughout production. He offered the directing job to one of his old USC professors, Irvin Kershner, even though he had never helmed such a big-budget effort before. Kershner initially turned down the offer because he thought anything trying to one-up Star Wars would be doomed to fail. Lucas then met with Kershner to explain that The Empire Strikes Back wouldn’t try to surpass the first movie, but would simply build on its mythology. Lucas’s assurance—and the fact that Kershner’s agent reminded him the job would be highly lucrative—convinced the professor to say yes. Instead of the desert planet of Tatooine (which was shot on location in Tunisia in the first movie), The Empire Strikes Back kicks off on the ice planet of Hoth, which was shot partially on location at the Hardangerjøkulen glacier in Norway. During production on The Empire Strikes Back, the worst storm in 50 years hit the region, leading to long delays in shooting. The minus-20-degree weather was so bad that at times the crew wasn’t even able to leave their hotel for fear of whiteouts or worse. So instead of delaying the shoot even further, Kershner and crew set up insert shots from the entrance of their hotel. Luke fleeing the Wampa cave in the final film is one of these shots. 20. VADER INITIALLY HAD SOME MEDIEVAL DIGS. McQuarrie created a series of thumbnail drawings depicting Darth Vader’s castle—some in an ice planet location and others in the middle of a lava planet—but the idea was scrapped for The Empire Strikes Back. But Vader’s castle ended up in Rogue One, the ice planet concept became Hoth, and the lava planet idea eventually became Mustafar in Revenge of the Sith. 21. YODA ORIGINALLY HAD A FIRST NAME. In early drafts of the screenplay Yoda was actually named “Buffy,” which was completely changed in subsequent drafts to the full name “Minch Yoda,” and then shortened to just Yoda. The eventual Yoda puppet was created by designer Stuart Freeborn in one week with help from The Muppets creator Jim Henson. Henson then recommended Frank Oz as Yoda’s main puppeteer (Henson knew Oz’s talent since he was the main puppeteer behind Miss Piggy, Bert, Grover, Cookie Monster, Animal, Sam the Eagle, and Fozzie Bear). 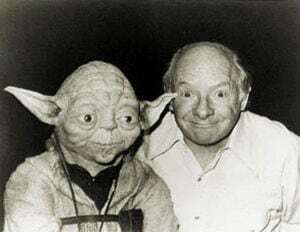 Freeborn would go on to model Yoda’s face after his own, and modeled his eyes after Albert Einstein to give the little green Jedi some wisdom. After the release of The Empire Strikes Back, Lucas lobbied for Oz to get an Oscar nomination for his performance, but he was ultimately disqualified for consideration when it was ruled that puppeteers aren’t actors. 22. STANLEY KUBRICK CAUSED MORE DELAYS IN SHOOTING. Sets were built for The Empire Strikes Back at Elstree Studios, where Kubrick was shooting The Shining at the same time. A massive fire broke out there in February 1979, burning down an entire soundstage. So Kubrick took over some of Empire’s studio space, and Kubrick—an infamous perfectionist—waited and waited, causing even more delays to Empire’s shooting schedule. 23. THE SPECIAL EFFECTS ANIMATORS HAD TO GET CRAFTY. Many of the shots of the Imperial AT-ATs on Hoth (which were inspired by the alien Tripods in H.G. Wells’s The War of the Worlds) were all done in-camera without bluescreen composites. Highly detailed snowy landscapes were drawn for the backgrounds, while stop-motion animation was used for the walkers in the foreground. The snow in these shots is a mixture of flour and micro-balloon epoxy filler. When they needed asteroids in the background during the Millennium Falcon’s escape through an asteroid belt, they simply spray-painted potatoes and filmed them in front of a bluescreen to composite later. And that space worm that nearly eats the Falcon? It was just a hand puppet shot at high speeds to give it scale. 24. ALEC GUINNESS DIDN’T WANT TO BE IN THE MOVIE. Sir Alec had a testy history with his legacy when it came to Star Wars. He described the first film as “fairy-tale rubbish,” and wanted nothing to do with The Empire Strikes Back. Lucas and the filmmakers eventually persuaded the actor to appear as the ghostly version of Obi-Wan with Yoda on Dagobah, but Guinness would only do it under very strict conditions: He would work only one day but would start at 8:30 a.m. and be done by 1 p.m., and would have to be paid one-fourth of a percent of the movie’s total gross. That 4.5 hours worth of work netted Guinness millions of dollars. 25. HAN SOLO’S BEST LINE WAS AN AD LIB. In the fateful exchange between Princess Leia and Han Solo before he’s frozen in carbonite, Leia says, “I love you,” and Solo quips, “I know.” But the exchange wasn’t written that way. The script had Solo just responding, “I love you, too,” before potentially never seeing his true love again. But both Kershner and Ford agreed the line was all wrong for a charming rogue like Han Solo. In a few final takes before breaking for lunch, Kershner switched things up, forcing Ford to think on his feet by spontaneously calling “action.” Carrie Fisher delivered her “I love you” line, while Ford naturally responded, “I know,” improvising what is one of his character’s most iconic moments. Another notable feat for Han is that, not counting the prequels, he is the only non-Force-user to wield a lightsaber, when he uses Luke’s sword to open up the dead Tauntaun for warmth while the pair is stranded on Hoth. 26. VADER’S BIG REVEAL WAS KEPT UNDER WRAPS FROM NEARLY EVERYONE. In early drafts of the screenplay, writer Leigh Brackett actually had Luke’s father appear to him as a ghost as a separate character from Vader, which was scrapped in subsequent drafts written by Lucas and screenwriter Lawrence Kasdan. The only people who knew that Darth Vader was Luke’s father before the scene was actually shot were Lucas, Kershner, and producer Gary Kurtz. Mark Hamill was told only moments before the first take. To keep the moment a secret for as long as possible, a false page was inserted into all scripts with Vader’s dialogue stating that Obi-Wan killed Luke’s father. David Prowse, the actor in the Vader costume, even delivered the “Obi-Wan killed your father” dialogue during takes while Hamill played the scene with full knowledge of the true lines. The lines were then added later when actor James Earl Jones recorded his dialogue for Vader. 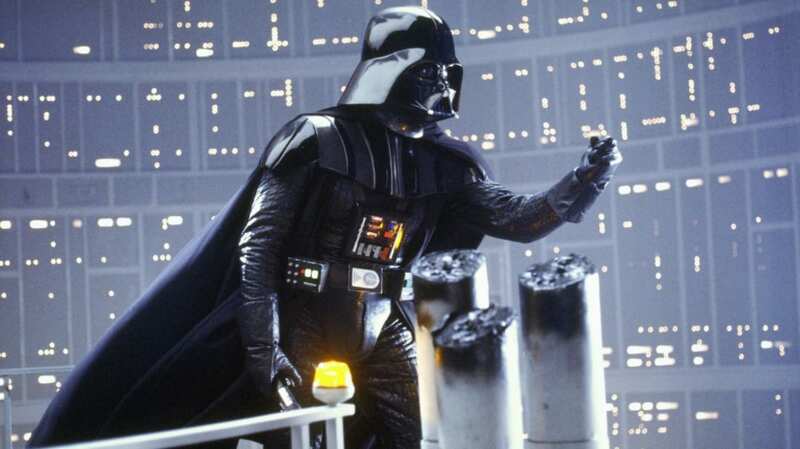 Dutch and German speakers should have known Darth Vader was Luke’s father from the get-go, as the Dutch and German words for father are vader and Vater, respectively. 27. THERE WAS AN OPENING CREDITS CONTROVERSY. To keep the iconic Star Wars logo with the opening crawl, Lucas and the filmmakers wanted to once again put the full credits at the end of the movie (which in the late 1970s and early ‘80s was an unusual practice), which caused the Writers and Directors Guilds to try to pull the movie from theaters because of credit rules. On Star Wars, writer-director Lucas’s name was at least at the start of the film due to the Lucasfilm Ltd. title card, but on Empire, the new director and writers were relegated to the end credits. The DGA and WGA fined both Lucas and Kershner, and Lucas paid them in full. The attempt to sabotage the movie by pulling it from theaters on a technicality caused Lucas to withdraw his membership from the DGA, WGA, and the Motion Picture Association (he has yet to return). 28. KUROSAWA RETURNED TO INFLUENCE LUCAS AGAIN, BUT IN A FAKE TITLE KIND OF WAY. The working title was a play on writer Dashiell Hammett’s 1929 novel Red Harvest, whose hard boiled plotline influenced Akira Kurosawa’s 1961 film Yojimbo. 29. CONTRARY TO LEGEND, RETURN OF THE JEDI WAS THE MOVIE’S ORIGINAL TITLE. Lucas and co-screenwriter Lawrence Kasdan originally titled their movie Return of the Jedi, but Fox thought the title was too bland, and forced the pair to change it to Revenge of the Jedi. The alternate title lasted so far into production that official trailers and posters for the movie featured the “Revenge” title until Lucas realized that within the mythology he created Jedis do not seek revenge. So the title was changed back to Return of the Jedi just weeks before the movie opened on May 25, 1983. The “Revenge” theme would pop up again—in the third prequel, Revenge of the Sith. 30. SOME BIG NAMES WERE ON THE SHORTLIST TO DIRECT RETURN OF THE JEDI. Steven Spielberg was Lucas’s first choice to direct the third installment of the series, but Spielberg was forced to bow out due to Lucas’s unceremonious exit from the Directors Guild, of which Spielberg was a prominent member. Then-relative newcomers David Lynch and David Cronenberg were also tapped to potentially direct. Lynch was coming off the commercial success of his movie The Elephant Man, but turned Lucas down to direct the big-screen adaptation of Dune instead. Cronenberg was also coming off of a hit—the horror classic Scanners—but also turned Lucas down to write and direct Videodrome. Lucas eventually settled on Welsh director Richard Marquand because he liked his previous movie, the 1981 WWII spy thriller Eye of the Needle. 31. RETURN OF THE JEDI WAS CALLED SOMETHING DIFFERENT ON PURPOSE. By 1983, the fervor surrounding new Star Wars movie had reached an all-time high, with cast, crewmembers, and the public willing to leak any new information about the storyline they could. To combat this, the new movie was shot under the production title Blue Harvest to throw people off. The thought was that if production notices proclaimed the new Star Wars movie was shooting nearby, there would be unwanted attention. But if a nondescript movie called Blue Harvest was shooting nearby, nobody would likely care. The fake title also helped the production team secure shooting locations without being price-gouged simply because it was a Star Wars movie. The filmmakers even came up with a fake tagline for their fake movie: “Horror Beyond Imagination." 32. IT TOOK UP TO SEVEN DIFFERENT PUPPETEERS TO BE JABBA THE HUTT. The Jabba puppet was partly inspired by stout British actor Sydney Greenstreet, who had appeared in such movies as The Maltese Falcon and Casablanca. The massive puppet, created by Yoda designer Stuart Freeborn, was controlled by a handful of puppeteers. Three puppeteers were inside: one controlled the right arm and jaw, another handled the left hand and jaw, tongue, and head movements, and both of them moved the body; a third person was in the tail. Outside, there were one or two people on radio controllers for the eyes, someone under the stage to blow cigar smoke up a tube, and another working bellows for the lungs. 33. HAN SOLO WAS SUPPOSED TO DIE. Solo’s fate after being frozen in carbonite was intentionally left up in the air at the end of The Empire Strikes Back because Ford’s contract was only for two movies. Ford eventually returned for the third, but urged screenwriters Lucas and Kasdan to kill off Han Solo because there was nothing constructive to do with his character. Kasdan agreed, and didn’t want Solo to survive the carbonite freeze in order to signal to the audience that anyone else in the movie could be next. Lucas ultimately vetoed the idea because he wanted an uplifting ending for the trilogy with all the main characters making it out alive. 34. LUKE ALMOST GOT A GIRLFRIEND. Once Mark Hamill realized Lucas’s grand plan with Vader as Luke’s father and Leia as his sister, the actor suggested that Lucas create a potential love interest for Luke to be introduced in Return of the Jedi. Hamill went so far as to gift Lucas a coffee table book of sci-fi art for inspiration with a request for Lucas to choose what she would look like from the designs in the book. In the Expanded Universe, Luke eventually got a girlfriend (and future wife), a fan favorite warrior named Mara Jade. 35. THE BATTLE OF ENDOR WAS ORIGINALLY SUPPOSED TO TAKE PLACE ON THE WOOKIEE HOME PLANET. Early drafts of the screenplay had the final battle between the Rebellion and the Empire take place around the Wookiee planet of Kashyyyk, with Chewie and his fellow walking carpets battling the Empire forces on the ground. The idea was eventually scrapped because Lucas wanted the thematic thrust of the scene—that a primitive society would rise up to help defeat a technologically advanced one—to ring true. Within the Star Wars universe, Wookiees are a technologically advanced species that can co-pilot ships like the Millennium Falcon after all, so the lesser-evolved similar species of Ewoks were created and the final battle was switched to Endor. Bonus Fact: Star Wars has a little homage to The Lord of the Rings: The word Endor, the home planet of the Ewoks, is the word for “Middle-Earth” in one of the Elvish tongues in J.R.R. Tolkien’s Lord of the Rings mythology. 36. THE SPEEDER BIKE CHASE WAS FILMED VERY, VERY, VERY SLOWLY. The mile-a-minute speeder bike chase on Endor between Luke, Leia, and a group of Scout Troopers was filmed in the Redwood State Park near Eureka, California that was about to be cut down for logging, giving the production near-free rein. To make it seem like the bikes were racing at breakneck speeds, Steadicam operators walked a slow, step-by-step path through the forest and shot at three-fourths frame per second for hours. When sped up on film to the standard 24-frames-per second, it made it seem as if the P.O.V. shots were going 120 miles per hour. 37. WARWICK DAVIS GOT HIS BIG BREAK BECAUSE OF FOOD POISONING. Then 11-year-old Warwick Davis was initially cast as an Ewok extra after his grandmother heard about an open casting call on the radio in England for little people to appear in Return of the Jedi. 38. THE FILMMAKERS WANTED A MOVIE STAR TO BE THE UNMASKED VADER. The one moment at the end of Return of the Jedi that fans had been waiting years for was seeing Darth Vader’s actual face. When the time came, audiences finally got that moment, and the face they saw was… Sebastian Shaw’s. Shaw, who was primarily known as a British stage actor before making his Jedi cameo, wasn’t the first person the filmmakers had in mind. They initially wanted to make it a momentous occasion by casting a well-known movie star like Laurence Olivier or John Gielgud to be behind the mask, but later changed their minds. Instead of a recognizable star they thought it’d be better if Vader turned out to be a nondescript person, and eventually Shaw fit the role. 39. THE SAGA COULD HAVE ENDED VERY DIFFERENTLY. During an early story meeting, Lucas pitched an idea for the end of Return of the Jedi that would have irrevocably changed the entire Star Wars saga as we know it. His idea started out very much like the end of Jedi now: Luke and Vader engage in a lightsaber battle with Vader ultimately sacrificing himself to save Luke by killing the Emperor, then Luke watches his father die after taking his mask off. But then, in the proposed ending, Lucas suggested that, "Luke takes his mask off. The mask is the very last thing—and then Luke puts it on and says, 'Now I am Vader.'" The idea was scrapped because Lucas didn’t want the story to go that dark, and wanted a happy ending after all. 40. THE TITLE OF EPISODE I WAS KEPT TOP SECRET. Lucas began writing the first prequel for a new Star Wars trilogy in November 1994, which was titled “The Beginning” all the way through production until Lucas revealed the new title as The Phantom Menace. To ensure the movie wasn’t pirated, the film was shipped to theaters under the title The Doll House. 41. AUDIENCES GOT THEIR FIRST GLIMPSE OF THE PHANTOM MENACE BY SEEING MEET JOE BLACK. Back in 1998, before every new trailer was just uploaded to YouTube, the first teaser for The Phantom Menace was attached to the movie Meet Joe Black, causing attendance for the Brad Pitt romance to spike. Audiences allegedly went to see the trailer and walked out before the feature even started. 42. 3000 YOUNG ACTORS AUDITIONED TO PLAY ANAKIN. Lucasfilm casting director Robin Gurland searched all over the world to find the kid to play the kid who would grow up to be Darth Vader. She and Lucas narrowed down their search to England, Ireland, Scotland, and North America, and scoured schools looking for non-actors and agencies looking for working actors. They auditioned 3000 young actors in all, but whittled the search down to three relatively unknown finalists: Devon Michael, Michael Angarano, and Jake Lloyd. Lloyd eventually won out, but would only go on to be involved in one non-Star Wars related role after The Phantom Menace. 43. NABOO WASN’T ORIGINALLY NAMED NABOO. Queen Amidala’s home world was originally called Utapau in Lucas’s early drafts of the screenplay, a name that should be recognizable to any Star Wars super fan. Utapau was the name Lucas gave to the desert planet that would eventually become Tattooine in the early drafts of what would become A New Hope. Though the name didn’t make it into the first films of the original trilogy and the prequel trilogy, Utapau eventually ended up in Revenge of the Sith as a Separatist outpost. 44. THE TITLE OF ATTACK OF THE CLONES WAS MUCH DIFFERENT DURING PRODUCTION. The working title for Episode II was “Jar Jar’s Big Adventure ,” a bit of self-deprecating humor by Lucas as a nod to fans’ abject hate for Episode I’s CG character. It might have been better than what Lucas ended up using for the actual title. When he heard that Episode II would be called Attack of the Clones while at a premiere for another film, Ewan McGregor’s initial reaction was, “That’s a terrible, terrible title." 45. ANAKIN WAS ALMOST PLAYED BY A MIDWESTERN STOCK BROKER. Similar to her work searching for an actor to play Anakin in The Phantom Menace, casting director Robin Gurland met with 300 actors to play the teenage Padawan learner for Attack of the Clones. While the role ultimately went to Hayden Christensen, other actors like Leonardo DiCaprio, James Van Der Beek, and Ryan Phillippe were also in the running. But another non-actor supposedly in the running was a 26-year-old Indiana stockbroker named Jeff Garner . Garner allegedly attracted the attention of actor and stuntman Ray Park (who played Darth Maul in The Phantom Menace), who sent Garner’s information to Lucasfilm after sparring with him at a karate tournament. 46. YOU WON’T FIND ANY OFFICIAL CLONE TROOPER COSTUMES OUT THERE. Lucas leaned on CGI pretty heavily in the prequels, and it shows. There were no physical Clone Trooper costumes made for Attack of the Clones or the rest of the prequels because every single one is a digitally-rendered CGI creation. 47. A YOUNG HAN SOLO WAS SUPPOSED TO SHOW UP IN REVENGE OF THE SITH. While Han Solo will get his very own film next year with Han Solo: A Star Wars Story, a pint-sized Solo could have showed up much earlier—in Revenge of the Sith. Character designs of a 10-year-old Solo were made for a scene that was eventually cut from the third prequel involving the boy being raised by Chewbacca on Kashyyyk, and helping Yoda find the location of the evil General Grievous. 48. LUCAS WASN’T THE ONLY DIRECTOR TO WORK ON EPISODE III. Lucas invited his old friend Steven Spielberg to help plan out certain set pieces on the film, including the climactic duel between Obi-Wan and Anakin and the battle between the Emperor and Yoda in the Senate chamber. Spielberg accepted the offer because he wanted to test out pre-visualization techniques before making his 2005 film, War of the Worlds. Spielberg is credited as assistant director on Revenge of the Sith. 49. REVENGE OF THE SITH WAS THE FIRST STAR WARS MOVIE THAT WASN'T RATED PG. The third prequel was rated PG-13 by the MPAA for “sci-fi violence and some intense images,” something Lucas attributes to the fiery finale when Anakin Skywalker finally transforms into Darth Vader. “I would take a 9- or a 10-year-old to it—or an 11-[year-old],” Lucas told 60 Minutes, “but I don't think I would take a five- or six-year-old to this. It's way too strong. I could pull it back a little bit, but I don't really want to." The darker trend has continued as more Star Wars movies have been released. 50. YOU CAN’T VISIT ANY OF THE EPISODE III FILM LOCATIONS. This is partly because there aren’t any locations to speak of. There was no live-action location shooting during principal photography on Revenge of the Sith. The entire movie was shot on soundstages composed primarily of blue screens and sets. In post-production pick-ups, background imagery of Phuket, Thailand was put into scenes as the Wookiee homeworld of Kashyyyk ; the Bernese Alps near Grindelwald, Switzerland stood in for Alderaan; and footage of the eruption of Mount Etna in Italy was used for the end planet of Mustafar .